Recently, my cousin Maara asked me to explore her great grandmother’s line, Maria Monserrate Malave Ayala, and that of her first cousin, Maria Angela Malave Vazquez and her husband, based in Barrio Rosario, San German. Among them is an African ancestor, Juan Tomas Gandulla, who lived nearly 90 years and built a foundation for his family. My hope is that further information will come to light concerning his African origins whether through documents, or via the DNA of his descendants- please feel free to reach out. Most of Tomas Gandulla’s life took place within the boundaries of the municipality of San German, in the southwest of Puerto Rico. Barrios of San German, Rosario Penon highlighted. In the nineteenth-early twentieth century, some Gandulla families lived in San German; that of Juan Tomas Gandulla lived in Barrio Rosario Penon, on a peak north of the Pueblo close to the southern wards. Thanks to its elevation, coffee was the crop that dominated the plantations in the area of the time. Separated by two peaks, and further defined by rivers, both the church and the municipality attempted to provide a separate set of services to those in Rosario Penon, in order to bridge the distance. 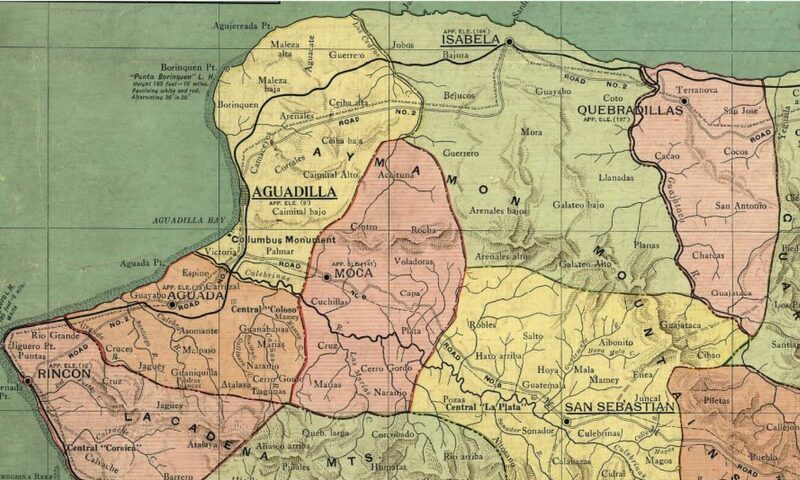 This 1888 map from the Archivo Digital Nacional de Puerto Rico, created by the Spanish military, illustrates the difficulties of traveling between the barrios of El Rosario on the left and Pueblo de San German on the right. The distance from the town center meant additional services needed to be provided. For convenience, i rotated the map’s orientation almost 90 degrees (E-W than N-S) to make it easier to read. One can note the roads and rivers that cross its areas, and Rosario Bajo on the northwest corner of San German. Unlike the previous map of San German’s wards, this military map provides a sense of the distances involved and the difficulties of getting through the region quickly before the arrival of the automobile decades later. In this sense the map is also political, given its creation in a period after the Grito de Lares and the Spanish American War, a promise of how far government intervention can reach after the repression ofEl Componte. The costs were high, and my cousin Teresa Vega has written about the death of her grandfather by lynching during the 1880s. Barrio Rosario Penon, San German [red outline] Google Maps April 2019. As the local population needed a place to worship, the church of Nuestra Señora del Rosario was established along with a Chapel near the center of the ward, with services scheduled to a designated priest’s travel there.. After 1885, once the Registro Civil began, the municipal administration used designated persons to bring the information for vital records from barrio El Rosario to barrio Pueblo to the south of San German. Juan Tomas or more frequently, Tomas Gandulla, was born in Africa about 1809, taken in slavery and brought to Puerto Rico sometime in the first few decades of the nineteenth century. His status as a freedman was writ large on the title of his death certificate as “Tomas Liberto de Gandulla” on the upper left of the document. Note that the Secretario’s name 4 lines above is Don Juan Antonio Gandulla, which may account for why Tomas’ name appears as Liberto de Gandulla. His surname points to a Gandulla owner sometime before the 1870s. His son Basilio Antonio Gandulla served as the informant. Now married, Basilio was a farmer living in Barrio Rosario, and stated his father’s parentage and situation: “Ignorando sus padres. Que no otorgo una memoria extrajudicial, a los mismo declaro manifestando no saber firmar.” “Parents unknown. Declared that he did not execute a will, and that he did not know how to sign his name.” Regardless of this status, it did not stop Tomas Gandulla from being involved with farming on his own account and having a family. Neither Tomas, his sons or his first wife appear in the Registro de Esclavos de 1872, so that any record of their freedom predates these forms. An additional search of parish records may yield such information as the Tomas Gandulla’s age at baptism and perhaps additional details regarding his origin. As a farmer or laborer before 1887, he may have owned or rented his land, so there may be deeds or contracts mentioning him in municipal records or within the series of notarial documents at the Archivo General de Puerto Rico. Tomas Gandulla was married twice, first to Maria Josefa Rivera and then to Maria Angela Malave Vazquez. With Maria Josefa, he had two sons, Basilio Antonio Gandulla Rivera (b. 1853), who married Mercedes Velez Candelario and Jose Cecilio Gandulla Rivera (b. 1854) who married Juana Maria Candelaria. Both couples had large families, Basilio and Mercedes had at least 7 children, while his brother Jose Cecilio with his wife Juana Maria Candelaria had some 10 children between the 1870s-1900s. Although Tomas and Maria Josefa did not live to see their 17 grandchildren, most of them survived to adulthood. So far, no additional information on Maria Josefa Rivera was found; she was probably born in the 1830s. Given the mention of ‘Liberto‘ on one of Basilio Gandulla Rivera’s documents, indicates he was born into slavery, which means that at birth according to law, his status followed that of his mother, Maria Josefa Rivera. She too was enslaved. Yet both sons and their families are listed as ‘Mu’ (Mulato) in the 1910 census. She could be of African or Afro-Indigenous or of other admixture descent, born on the island or brought there for sale. Perhaps parish documents hold some clues, if not answers. Family of Juan Tomas Gandulla and Maria Josefa Rivera, San German. Chart by EFS, 2018. Maria Angela Malave Vazquez (bca 1862) became Tomas Gandulla’s partner sometime mid-decade in Barrio Rosario Bajo and likely, lived in Barrio Rosario Penon, San German in the early 1880s. This was a December-May relationship, as Tomas was 40 years older than Maria Angela. Given that this marriage took place sometime in the 1880s, opens the possibility of yet another wife, given that Tomas’ previous marriage was two decades earlier. Tomas Gandulla and Maria Angela Malave had two children, Juan Tomas Gandulla Malave (b. 1887) and Maria Monserrate Gandulla Malave (b. 1889) who lived to age 44 and died of tuberculosis in August 1933. She was married to Juan Alicea. Maria Angela Malave died of Cloro-anemia, a form of iron deficiency anemia in 1902 at the age of 40, some three years after the death of her husband Tomas Gandulla in 1889. Questions remain about the relationship between Tomas Gandulla and Maria Josefa Rivera, how they met and what their lives were like building a family during a time of great transition for POC in Puerto Rico. Despite their freedom, traces of resistant attitudes to emancipation can be found within documents. The birth certificate for Tomas and Josefa’s granddaughter Maria del Carmen Gandulla Velez contains small details that may reflect the microaggressions endured in daily life by the Gandullas because of their ancestry and class. Does even the documentation bear this kind of disregard? Torn and water stained pages full of insect holes pit the tropical environment against paper, weighted by records for a diverse rural population. Advancing the frames of the microfilm shows that the form beneath this page was not filmed, and the start of the document is covered by the stitched slip, “Nacimientos de 1890, Leg. 31 Exp. 81e” from the Archivo Municipal de San German. it is still remarkable that it survived all this time. For Basilio and Mercedes’ daughter, Maria del Carmen Gandulla Velez, their child’s name may simply appear as Carmen on the left hand margin, despite her full name appearing in the document, a level of care more often taken with people considered blancos of higher status. In his post for the municipality of San German, Juan Antonio Gandulla— “D. Juan A. Gandulla, Secretario”, was tied to the family who once owned Basilio’s father, and insured that there was no mistake between their lines, so that some social divisions continued. Yet additional documentation may reveal the complexity of relationships and networks that sustained families in Barrio Penon and beyond. The statement that D. JA Gandulla, recording the birth wrote near the bottom, highlighted in a detail from the birth certificate below was: “Que es prieta por linea paterna de Tomas Liberto de Gandulla y Ma. Jose Rivera.“ “She is black via the paternal line of Tomas Gandulla’s Freedman and Maria Jose Rivera” As secretary, D. Juan A. Gandulla made sure to record the girl’s paternal lineage as black. Yet this identity was far more flexible than the secretary could have imagined, for in the coming decades, the racial identity of the Gandulla grandchildren is recorded as white. Tomas Gandulla’s son,, Jose Cecilio Gandulla Rivera and his wife Juana Ramona Candelario also had a daughter, Maria del Carmen Gandulla Candelario, born in February 1890. In this record, Jose Cecilio appears as Jose Cecilio Liberto de Gandulla, and he reported both the birth and the death of his daughter, who only lived for one day. “Jose Cecilio Liberto de Gandula. detail, Acta Nacimiento Maria del Carmen Candelario, 14 Feb 1890. So, despite Juan Cecilio’s accounting for his identity as father of Maria del Carmen in person, her surname is listed as Candelario, not Gandulla. By 1909 the law was changed to include details concerning paternity, and many women took advantage of this opportunity to amend the birth records to identify the father of a child born out of wedlock. Still, in other municipalities, a father’s willingness to identify his paternity could be followed by the use of his surname for births out of wedlock. These details suggests that Maria Josefa/Jose Rivera married her husband while they were both enslaved, because their son, Jose Cecilio Gandulla Rivera appears as ‘Liberto’ — freedman— in the 1890 record for their granddaughter, Maria del Carmen Candelario. As this happens in 1890, not 1870, why was it necessary to continue mentioning the status? Was there a Jose Cecilio Gandulla blanco? or was it simply pulling rank in the rural society of San German? While no additional information has turned up on his first marriage to Maria Rivera, it is possible that despite enslavement, they married and had a family before 1873-1876. Maria Rivera was alive at least until 1854, when her second son, Jose Cecilio was born. In the 1910 census, both Jose Cecilio and his brother Basilio Gandulla’s families were working on a coffee plantation, in Barrio Rosario Penon, on the “Camino de San German a Rosario, sendero del Penon, Rio Abajo” (Road from San German to Rosario, path of Penon, Lower River). Their sons are listed as laborers. Jose Cecilio Gandulla’s death certificate of 1926 lists his occupation as “Agricultor— finca de su padre”, which tells us he worked his father’s farm as a farmer, and likely inherited the farm. Over the course of his lifetime across various census records makes visible the change in economies a decade after the Spanish American War. By 1930, only Basilio Antonio Gandulla remained, and labor there was now devoted to a different crop, sugar. During the mid-nineteenth century, the area of San German had the major plantation crops of coffee, sugar along with minor crops that fed the population. Without additional documentation, it is difficult to say what other crops the Gandulla grew besides coffee, or what kinds of situations and arrangements they navigated. By the early twentieth century, social conditions and status changed, and these branches of the Gandulla family continued to grow. Whether family members worked in the fields, or in the home that served as its administrative center, or labored as service people within the town, the cycles of sowing, tending and harvesting, overlaid by the Catholic calendar structured their lives . As the details across documents show, family histories were determined by shifting conditions of freedom, enslavement and class. In 1910, six grandsons of Tomas Gandulla worked as farm laborers, four granddaughters as domestics, a generation born on the cusp of emancipation. Writing Juan Tomas Gandulla back into history was part of a larger research project for Maara Vazquez., “Finding Maria Monserrate Malave.” March 2018. “Puerto Rico, Registro Civil, 1805-2001,” database with images, FamilySearch (https://familysearch.org/ark:/61903/1:1:QVJ7-VWTG : 17 July 2017), Juan Tomás Gandulla in entry for Juan Tomás Gandulla, 20 Dec 1887; citing San Germán, Puerto Rico, oficinas del ciudad, Puerto Rico (city offices, Puerto Rico). “Puerto Rico, Registro Civil, 1805-2001,” database with images, FamilySearch (https://familysearch.org/ark:/61903/1:1:QV1Y-RP5L : 17 July 2017), José Cecilio Liberto Gandulla in entry for María del Carmen Candelario, ; citing San Germán, Puerto Rico, oficinas del ciudad, Puerto Rico (city offices, Puerto Rico). “Puerto Rico, Registro Civil, 1805-2001,” database with images, FamilySearch (https://familysearch.org/ark:/61903/1:1:QVJZ-PMJ6 : 17 July 2017), Maria del Rosario Varquez Y Acosta in entry for Maria Malavé Y Varquez, 19 May 1902; citing San Germán, Puerto Rico, oficinas del ciudad, Puerto Rico (city offices, Puerto Rico). “Puerto Rico, Registro Civil, 1805-2001,” database with images, FamilySearch (https://familysearch.org/ark:/61903/1:1:QVJ7-V8M3 : 17 July 2017), María Malavé in entry for María Monserrate Gandulla Y Malavé, 19 Jan 1889; citing San Germán, Puerto Rico, oficinas del ciudad, Puerto Rico (city offices, Puerto Rico). “Puerto Rico, Registro Civil, 1805-2001,” database with images, FamilySearch (https://familysearch.org/ark:/61903/1:1:QVJX-82XH : 16 July 2017), Jose Cecilio Gandulla Rivera, 25 Nov 1926; citing San Germán, Puerto Rico, oficinas del ciudad, Puerto Rico (city offices, Puerto Rico). While in Puerto Rico over a decade ago, I bought copies of old photographs at Tienda Cesto in Aguadilla. Part of the store was given over to tables with sets of binders, each containing photographs from different municipalities. There were a small number of images of Moca that I bought. Looking for items for the next Black ProGen Live (Ep.72 – join us! ), I pulled my small binder of photographs as I remembered an image with a coffin. As I’d soon learn, my connections were closer than I could’ve imagined. Near the end of September 1929, a group of men and children stood in the midday sun before a coffin for a photographer, in Moca. According to the notation on the photograph, it was Balbino Gonzalez’ father and the location was in Barrio Plata, a rural location some 5 miles away from the center of town.. Recently finished, the shiny coffin, painted a dark enamel color and embellished with stamped metal decorations sat on a frame that was to shortly transport Gonzalez to his final resting place in the Viejo Cementerio Municipal de Moca in what was popularly known as Calle Salsipuedes . Given that the son’s name appeared with a date, I used that as a guideline to find Balbino Gonzalez’s father in the Registro Civil. The death actually occurred ten days later. Balbino Gonzalez Jimenez was one of five children of Jose Manuel Gonzalez Perez (1863-1929) and Juana Bautista Jimenez Soto (1868-1926). He is the young man in the suit at the center of the photograph. He was single at the time of his father’s death on 27 September 1929. He came from Santurce where he was a teacher, to report his father’s death to the Registro Demográfico. His suit, tie and hair speak to fashion in the metropolis of the San Juan metropolitan area, a self awareness already honed by his profession. The other men in the photo wear looser fitting shirts, and the straw boatera hat is a respectful nod to artesanos and locals that decades later became part of the dress of Los Enchaquetaos, a fraternal group founded by Pedro Mendez Valentin. Here the stiff hat functions much like the formal top hats used by funeral staff. Jose Manuel Gonzalez Perez, was an 82 year old widower, who worked as a professor. He lived on Calle Nemesio Gonzalez, and died the morning of 27 September 1929 of cardiac insufficiency. It’s likely that as his condition worsened, family was contacted as his time neared. His son Balbino Gonzalez Jimenez was summoned home, and he was the informant for his father’s death record above. While he was unable to report the names of his father’s paternal and maternal grandparents, he gave the names of Jose Manuel’s parents: Jose M. Gonzalez (ca 1814-bef 1899) and Juana Perez Guevara (1819-1899)  Jose Manuel was one of three siblings from Barrio Plata, a long narrow municipality that borders San Sebastián on its eastern border. A 1947 map of Moca shows the former location of the cemetery at the end of the street that leads from the Plaza in front of the church to the Cementerio Municipal. Among the group standing in the photograph on the right, is a tall pale man, who may in fact be Alicides Babilonia Talavera, my great grandfather. Later, his son, Alcides Babilonia López also made coffins in a nearby workshop. 1947 Map of Moca, Puerto Rico. Juan Manuel Gonzalez Perez lived on Calle Nemesio Gonzalez; Alcides Babilonia Talavera lived on Calle Juan B Huyke. The procession to the Cementerio Municipal may have passed the former home of the deceased. Calle Nemesio González in Moca ran through Barrio Pueblo, and this is the street that Jose Manuel Gonzalez Perez lived on; my great-grandfather Alcides Babilonia Talavera and grandfather Alcides ‘Alcidito’ Babilonia Lopez lived in homes next door to each other on Calle Juan B. Huyke. This is the backdrop of the 1929 photograph. As this was before the establishment of a funeral home, many people had a wake at home, and the Gonzalez family probably did the same. Given the heat, it lasted a day, with ice piled beneath the coffin and a plate piled with salt placed on the chest of the deceased. The lid may or may not have a glass window, so that the case can stay closed and the deceased could still be seen. Among the group standing in the photograph there on the right, is a tall pale man, who may in fact be Alicides Babilonia Talavera, my great grandfather. Later, his son, Alcides Babilonia López also made coffins in a nearby workshop. According to my cousin Diany, Alcides was known for his coffins. When he was younger, he had a room with samples where people could choose fabrics for the inside of their coffins. There were always stories with a touch of the supernatural about them. He had an order from a man who needed a coffin, and worked on making it with a hammer. after midnight, he couldn’t find the coffin. Another coffin was tossed through the window, so he picked it up and finished the job. The details in the photo give an idea of decorative funerary practices in rural areas, which ran from the simplest unadorned box to a highly finished coffin with stamped metal cherubs holding a garland inscribed with ‘Que en paz descanse’. Clearly then, this was top of the line and the maker stands at the head, arms folded behind him, separating him from the family next to him. The identity of the man in the flat top hat is Lorenzo Caban Lopez, who was married to Lucia Alonso Font (1874-1956). In 1901 he was appointed by the municipal government as a Sepulturero y conservador (Gravedigger and caretaker) and as a Celador (Maker of grave markers and crypts) for the old Cementerio Municipal, which he did for 23 years until August 1936. after his death, his son Feliciano ‘Chano’ Caban, who stands to the left, became Sepulturero. He and his family lived on the edge of Barrio Pueblo, on Calle de la habana. As it happens, I share many connections with this Caban line. Lorenzo was the father of Domitila Caban Lopez (1902-1982), my grandfather’s last partner before his death in 1948. She was a tejedora, a lacemaker and I exhibited some of her lace work at UPR Mayaguez along with that by other tejedoras, some who are no longer with us. Like lace, weaving these details together give us a recognizable pattern as we work through the questions. In the 1940 census, Alcides Babilonia Talavera was a divorced widower, and it is not until then that his occupation is listed as a maker of coffins. in the 1910-1930 census his occupation is Agricultor- finca de cafe (Farmer- coffee farm). By 1920, his ex-wife, Concepcion Lopez Ramirez (1863-1925) lived next door to him and had a business as a ‘modista’ a dressmaker, living with several of her children while Alicides lived next door with children as well. In January 1925, Concepcion died suddenly. His reaction was to call a photographer for one last image, altered to evoke the life of a portrait. It merely succeeded at lending an uncanny gaze emanating from her painted in eyes. I am not sure how much this experience shaped his funeral avocation, but he was likely well acquainted with the steps of caring for the dead, as people still arrived and departed from their homes. My grandfather, also named Alcides, made coffins, and in 1940 appears as a “ carpintero – propio taller” a carpenter with his own workshop. It was the year he married my grandmother Felicita, who later died that year of tuberculosis, which took many family members. By 1948, knowing he was going to die, he made a simple pine box for himself, but that’s another story. He worked making coffins with his friend Rito Vargas, husband of Maria Lassalle, the lacemaker of Moca. Out of death comes a refashioning of self, family and the ways we decide (and are able to) to honor their lives. Unexpectedly, a photograph brings me closer to the past and to even more relatives, as I learn more about the work of Lorenzo Caban Lopez and Alcides Babilonia Talavera. QEPD. Acta Defunción, “Puerto Rico, Registro Civil, 1805-2001,” database with images, FamilySearch (https://familysearch.org/ark:/61903/1:1:QVJD-J3PV : 17 July 2017), Jose Manuel Gonzalez Y Pérez, 26 Sep 1929; citing Moca, Puerto Rico, oficinas del ciudad, Puerto Rico (city offices, Puerto Rico). Acta Defunción, “Puerto Rico, Registro Civil, 1805-2001,” database with images, FamilySearch (https://familysearch.org/ark:/61903/1:1:QVJD-FTL3 : 17 July 2017), Juana Perez Guebara, 17 Oct 1899; citing Moca, Puerto Rico, oficinas del ciudad, Puerto Rico (city offices, Puerto Rico). Lorenzo Caban Lopez’ death certificate lists his occupation: Celador- cementerio, Gob Municipal hasta Ago 1936, 23 anos; Acta Defunción “Puerto Rico, Registro Civil, 1805-2001,” database with images, FamilySearch (https://familysearch.org/ark:/61903/1:1:QVJD-NJMT : 17 July 2017), Lorenzo Caban Lopez, 14 Nov 1936; citing Moca, Puerto Rico, oficinas del ciudad, Puerto Rico (city offices, Puerto Rico). Antonio Nieves Mendez, Historia de un pueblo: Moca . Lulu.com 2008, 49. Victor Gonzalez, “Los Cuentos de Chano Caban” Mi niñez Mocana y algo más…. Segundo edición, Impresos Ideales, 1990, 19-21. If you’re doing Latinx genealogy tied to the Spanish empire, you’ll eventually hit a version of the Registro Civil, the Civil Register for births, deaths and marriages that keep track of the population. Depending on the country, these volumes of vital records begin in different years, and are incredible sources of information… depending on how well the person reporting the death knew the family. Once you become more familiar with these volumes, you’ll notice shifts in the formatting as it goes from completely handwritten (for better or for worse) to progressively printed forms for entry. The forms evolve as the legal system evolves, with different requirements specified and vetted over time. Ok so stay with me– while this is an example from Puerto Rico, there’s a bigger lesson about details here for you to think about. Recently, someone asked me about an ancestor tied to the Muniz line, and if you do genealogy, you know one person is never enough. So here’s an example of two 1917 death certificates, with significant differences in the information given by the Declarante (Informant). It’s a great example of the variations in registering information on life passages. On the left, is the certificate for Petronila Aviles Gonzalez ( -1917), and on the right, Faustino Muniz Mendez (1877-1917). For Petronila, the informant is the child of the deceased. Basically her son, Basilio doesn’t know the names of his grandparents (pink arrows). For Faustino, the informant is a sibling of the deceased. His brother Casimiro knows the wife, her age, the names of their seven children and… and this is a big one, the names of his paternal and maternal grandparents. On the right, in Faustino Muniz Mendez’ certificate, his informant is his brother Casimiro Muniz. Casimiro is able to name Faustino’s wife, his seven children, his parents, his mother’s parents and his father’s parents. There are 16 people listed on his death certificate, and only 3 are listed in the transcription on FamilySearch. Good luck finding it by search- Muñiz is spelled Muñez. 2. Que era casado con Maria Hernandez, natural de Moca, blanca, de treinticinco anos de edad de cuyo matrimonio tuvieron siete hijos, seis que viven Amador, Martina Muniz y Hernandez, Toribio, Lauro, Telesforo, Francisco, Eulogio, los que residen en el barrio Cuchillas y este llamado Pablo difunto. So we know how old his wife was, that they had some 7 children, one no longer living, and where his grandparents on both sides were from. It pays to go beyond the transcriptions on FamilySearch and Ancestry. That way you can avoid situations like having a parvulo (infant) listed in your tree as your great grandmother because you didn’t take the time to read the original document. Thanks to Casimiro’s statement, we have three generations on one document, and the information brings us closer to the early 1800s. Don’t take the notations for race literally, use it as a prompt to learn more about how people are categorized by official services. Most of this information is not transcribed on Ancestry or FamilySearch. Not every certificate from the Registro Civil has this range of information, it varies by year, with some decades offering up more data than others. Feel free to watch the upcoming episode #72 of Black ProGen LIVE with hosts Nicka Smith & True A. Lewis— coming up on Tuesday 13 November 2018: Life After Death: Getting More With Death Records – click here to watch live on YouTube. Tune in & discover the leads you can gather from obtaining, reviewing and distilling death records. I’ll be on the panel!